In any brick and mortar business it’s important to have a set time to clean and make tweaks on existing equipment. For some businesses it’s a few hours needed once a month; For float centers you will need this once a week. If you are just starting your float center business, you may want to set aside an entire day per week for this. 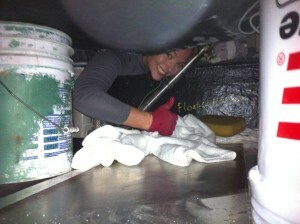 Knowing you will need a day for cleaning is especially important to understand when you are planning your float center. You may be planning on being open 5 days a week, but you will still need someone to come in on a sixth day of the week for fine tuning (that someone is probably going to be you). Cleaning Day will go best if you have a clear plan for your upkeep. I recommend making a checklist of items that need a deep clean each week. In our 3 tank center it takes about 4 hours for a good deep clean. When team up or have volunteers, the time can be reduced to just a few hours. In addition to cleaning, it’s great to have a time where you can make a lot noise and work on your tanks, make physical improvements etc. Just last week I needed an entire day to replace the filter system of one of our tanks. I would not have been able to do this if we didn’t have a day set aside for cleaning. I would assume that the first 6 months to a year you will want an extra day not only for cleaning, but for adjustments in your float center as you make fixes and improvements. Eventually you will find you don’t need to come in for improvements as often, just for cleaning. By making sure you have a consistent day and time for cleaning you will ensure a clean and presentable environment for your customers each week, no matter how long your float center has been open. Great advice Dylan! I’ll add that with a 24-hour schedule it gets even crazier… finding time to even pound a nail into a wall is nearly impossible, so our ‘clean day’ is crucial for any projects that make noise. We’ve also found that with a 24-hour schedule, all of the tank levels (including pH and specific gravity) need to be adjusted twice a week. Rather than shut down the center for a full 2nd day, we close down one tank at a time for deep cleaning 1/2 way through the week. Hope this helps, and keep up the great content! Great information, as always! Thank you Dylan and Sandra.